Ruddy amber, almost orange hue. Pleasant aroma of roasted malts & hops. Adequate, long lasting head with good lacing. Mmmmm, I thought as I passed the grocer's shelves looking for something different! There it was...the beer that had finally won me over with their "Brewmaster's Collection" that you've seen in my previous posts. I am a fan of 'Marzen' style Oktoberfest beers, so off to the lab to experiment. 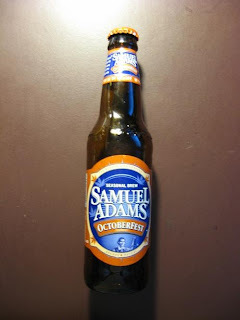 At first blush the looks of the color and head were good indications there was another winner in the Sam Adams bunch. Upon tasting, however, I was less than thrilled. Oh, don't get me wrong. It's a fine lager worthy of purchase, but it's either my level of expectation of a Marzen style beer (oh, my favorite) and a bit of how the other Sam beers & ales had recently won me over. I give it a solid "B"...Jim, keep up the good work.